← Nice to meet you! Roughly three months ago, my husband and I were wandering through Canadian Tire and we happened to pass a big seed display. We hadn’t put much thought into our summer flowers yet, so while he wandered the aisles looking for camping supplies, I started scanning the seed packets for plants that fit our growing conditions the best. The flowers did have a certain visual appeal, but many of them required full sun, wouldn’t work well in small containers, or wouldn’t have enough time to fully mature and flower before the fall weather arrived. For a moment I considered whether I should just buy greenhouse-started plants like I’d done in previous years. But then, I discovered the back-side of the seed rack – the vegetable side. Of course, being late May already, I’d pretty much missed the ideal time to plant most of the vegetables I was interested in growing. But then I discovered a packet of baby carrot seeds. Baby’s, hey? Perhaps they would grow to fruition faster than normal-sized carrots? Luckily, my initial assumption was correct. These “Little Finger” carrots would produce little orange stubs within 55-60 days! I have to admit that it has taken a little bit longer than 60 days for these babies to mature, but it’s been worth it all the same. Our balcony is partially shaded by the balcony directly above us, so our plants are always a teeny bit starved for light. But I’m a firm believer that if you put seeds in the ground, something is going to happen. It’s just a matter of what. I’ve now harvested two delicious crops of these baby balcony carrots, and I have to say that I’m very pleased with the results! Although they’re a little twisted, gnarly and oddly shaped, they pack a rich carroty flavour that I never taste in store-bought carrots, and their sweetness is balanced perfectly by their crunchy texture. 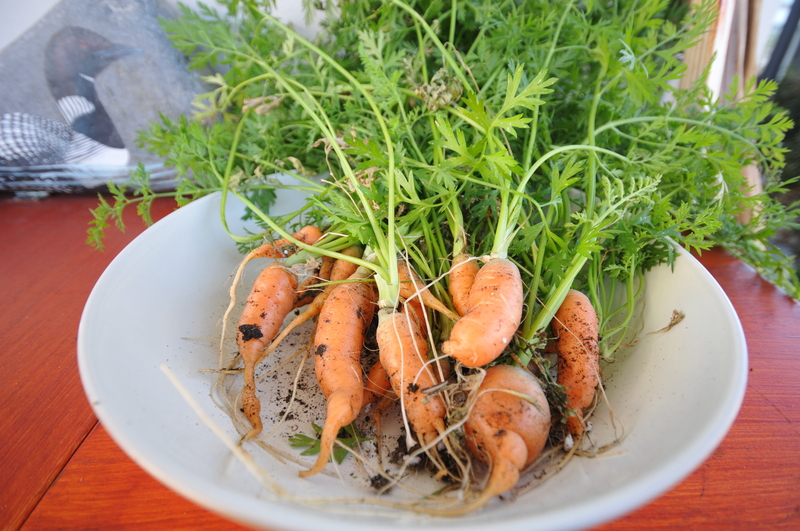 1st carrot crop of the season! 2nd crop, fresh out of the soil. I will definitely try planting carrots again next year, and I’ve learned a few things to help me improve my crop. Mostly, next year I’ll start my seeds earlier, and stick more steadfastly to the planting instructions! I did end up buying some flower seeds as well, but none of them were nearly as successful, or fun-to-grow, as the Little Finger carrots. This entry was posted in Carrots, Food Gardening, Gardening, Vegetables and tagged carrots, gardening. Bookmark the permalink.